Please make sure to leave your comments on the reviews you liked! 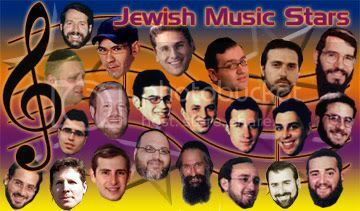 To review the entire listing of the reviews, go to http://www.jewishmusicreviews.blogspot.com/ or scroll all the way to the bottom. Just finished listening to MBD's latest album and here's my early preview that I promised. First a few comments on MBD in general. NOTE: I don't have the actual CD, I was provided with MP3 files instead so I don't know the track names - therefore I will use numbers. I don't think order will be different on the final CD. (Note from Mindy: In parentheses I added the name of the song so you know what Moishe meant). 1 - (Maaminim Bnei Maaminim) This is the title track as far as I know. I heard this track a while back when it was still in the recording process and fell in love with it. That really got my hopes for the rest of the album. The only thing that changed about this track is the addition of kids' choir and the track still has MBD "spirit" to it (those who heard MBD a lot will know what I mean when they hear this one). It probably will go on to become a hit and it does deserve it. It has a great beat and good rhythm. Probably the best track on the whole album, IMHO. 2 – (Torah Hak'doishah) This track start off slow but picks up a bit in the end. Doesn't use too much synthesized music which makes it even better. Again, it's done in typical MBD style and you can probably find a comparable song on almost every album. 3 – (Lefonov N'avod )This is one weird track;-) Just in case any of you hear goyish songs from time to time (i.e. walking in the street from time to time), beginning with Cher's "Believe", a lot of goyish artists use a certain digital effect which I can't really describe. Those who heard the aforementioned song by Cher will know exactly what I'm talking about. Those who didn't and will buy this album, just listen to the track and you'll get the feeling that something funny is happening to MBD's voice on some occasions - well, that's exactly what I'm talking about. AFAIC, having heard that effect so many times, it does get annoying. Some of you might like it, though. 4 – (Midas Harachamim) Another ballad by MBD. It seems like alternates between a fast and slow song and it does make sense - you don't get tired of one or the other. 5 – (Kaveh El Hashem) Think Yisroel Barukhov's "Kavei El Hashem" performed by MBD. Enough said. 6 – (Shir Chadosh ) Another decent track. Has very good flow to it (not too slow and not too fast) and should appeal to all MBD fans out there. 8 – (V'Yishomah) Pretty good chashanah song. It has a typic rhythm and will probably also do some damage on the charts. Nothing outstanding though. 9 – (Mi Hoish) Yet another rendtion of "Mi HoIsh". Seems to be pretty popular to do nowadays after becoming such a major hit by Shelsheles. I still like their version better though. 10 – (V'Chusoh Na )This one is also nothing to write home about. While decent sounding, I thought that'd put something else to finish off the album. All in all, except for track #3, it does seem to be a pretty solid offering from MBD. It will launch a hit or two but probably won't win MBD too many new followers (like he did it with "Moshiach", "Tomid B'Simcha", or "Eid Oid Milvadoi"). One thing that I really miss is lack of an English song that MBD always thrived on. Neither was there a Yiddish song - although some do sound like it, they are still in Loshon Kodesh. Will I buy a copy once it comes out - YES! Should you? It depends. If you like MBD, definitely get one since you'll probably enjoy it. If you don't care much for MBD, this one won't change your opinion. If you want to get a better idea what MBD is also about, better go and buy one of his works from late 80's early 90's like "Double Album","Moshiach","MBD and Friends", etc. since this one will probably leave with a sense of a slight disappointment. Comments on this review can be left below.